SACRAMENTO, Calif. (AP) — Whether Democrats win a veto-proof supermajority in both chambers of the California Legislature will likely come down to a sprawling state Senate district west of Fresno that looks on paper like it should be a lock for the party. Democrats have an 18-point voter registration advantage in the district, where two years ago voters favored Democrat Hillary Clinton by 20 points over Republican Donald Trump. Half of the registered voters in the district are Latino. And yet the seat has stayed in Republican hands. It’s open now because incumbent Anthony Cannella is termed out. That has presented an opportunity for Democrats who are just one vote short of the 27 they need for a two-thirds supermajority that would allow them to raise taxes, suspend legislative rules or override vetoes without Republican votes. The party is expected to hold its supermajority in the 80-member Assembly, where they need 54 votes and have 55. Outgoing Democratic Gov. Jerry Brown sometimes clashed with fellow party members in the Legislature who wanted significantly more spending, especially on social programs. His likely successor is Democratic Lt. Gov. Gavin Newsom. A supermajority could give him an easier path to expanding the tax base and the health care system. If longshot conservative Republican John Cox upsets Newsom, his actions could be overridden by a two-thirds vote. Republicans are pinning their hopes in the district on Madera County Supervisor Rob Poythress while Democrats are backing Assemblywoman Anna Caballero, who lost to Cannella in 2010. Republicans so far have been overachieving and Democrats and Latinos underperforming in early ballot returns, setting up a nail-biter election night Tuesday, said Paul Mitchell of Political Data Inc., which collects voter data from counties. The key could come from a swath of the district “where the Democrats are almost more conservative, blue collar, work in the agricultural industry and can be more swing voters,” he said. The money pouring into the race underscores the importance to both parties. More than $7.7 million has been spent, with the two parties dumping in $4.1 million, tops among all legislative races in the state. Democrats have spent $2.3 million of that total. Poythress said his election would prevent “truly a one-party government” in Sacramento, which he called bad for democracy. Caballero played down the importance of a supermajority, saying the party isn’t monolithic. “People are hurting right now and the last thing I’m going to want to do is raise taxes,” she said. Democrats including Caballero used their supermajority in the Assembly last year to raise gasoline and other transportation taxes by $5 billion a year. They were one vote short in the Senate until Cannella became the only Republican to support it. Caballero hails from the Salinas Valley, across a mountainous divide from Poythress’ home in the inland San Joaquin Valley. Caballero moved there in 1979 as an attorney representing farm workers. She held appointed or elected positions in Salinas from 1986 until her election to the Assembly in 2006. After she lost to Cannella, Brown appointed her secretary of the California Business, Consumer Services and Housing Agency until she returned to the Assembly in 2016. Poythress was born in Madera, where he manages a bank and is a partner in a hardware store and the family farm. He was elected to the City Council in 2004 and county board in 2016. Both candidates say they’re good fits for the agricultural district that includes parts of six counties. Caballero is a leader of a group of pro-business, moderate Assembly Democrats and holds some policy positions anathema to party leaders. 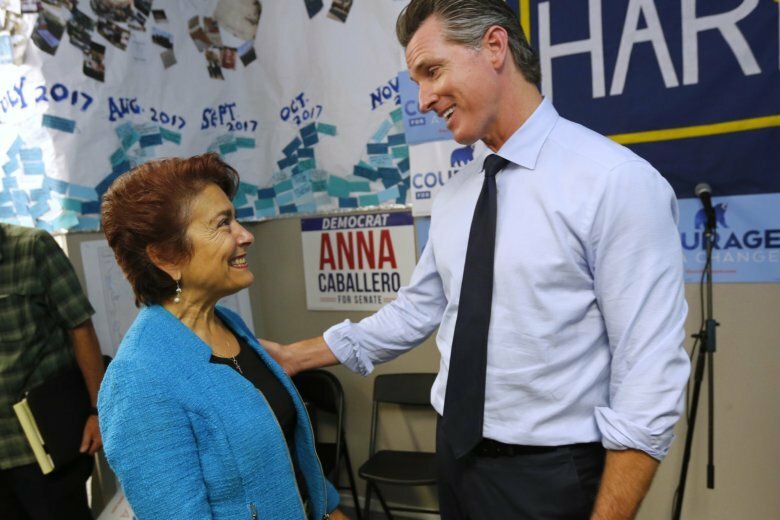 She blames the state’s strict environmental laws for stalling affordable housing in the district that’s been hard-hit by exorbitant costs spilling over from nearby Silicon Valley and wants to carve out exceptions or a speedier environmental review process. Poythress more broadly blames burdensome laws and regulations for hobbling development. Caballero, like Poythress, supports more water storage, either behind dams or underground, and opposes Brown’s proposal to move more Northern California water through massive tunnels. She supports Brown’s high-speed rail project to connect rural commuters to big-city jobs. Poythress opposes it as an ill-conceived waste of money. Caballero supports the state’s sanctuary law to protect some immigrants in the country illegally from deportation, while Poythress said the law protects felons. He backs more vocational training to bootstrap the region’s farm labor economy and a guest visa program to bring in laborers legally from other nations. She said the valley’s future lies in crops that use less water, and in adopting robots and mechanization to make up for fewer farm laborers. Those automated “smart farms” will mean higher-paying, less back-breaking agricultural jobs, she said. Caballero has a reputation of fighting for her district and the gas tax seemingly hasn’t sparked the voter revolt Republicans had sought, said Darry Sragow, a former Democratic strategist who publishes the nonpartisan California Target Book that tracks legislative races. But the bulk of the district’s voters are in the Central Valley, where residents may view Poythress as one of their own and Caballero as a coastal Democrat too aligned with the San Francisco Bay Area, said Target Book editor Tony Quinn, a Republican demographics expert. “The one opportunity the Republicans have in what looks like a horrible year is the demographics of this district work against any candidate who comes out of the Salinas area,” Quinn said.